Hajia Aishat Buhari, wife of the Presidential candidate of the APC, General Muhammadu Buhari has replied the wife President Goodluck Jonathan, Mrs. Patience Jonathan, who has been campaigning that Buhari will jail her husband and other corrupt politicians if elected President in the March 28 election, saying Patience needs not fear as Nigerians only want a Change in the way Nigeria is being run presently. 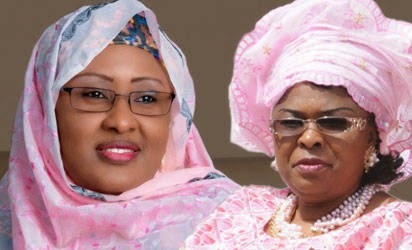 Speaking at a mega rally where she interacted with Women in Edo State, Hajia Buhari said the PDP’s attempt to paint her husband black with the tar of religion is a desperate attempt to hoodwink the people, saying only those who want to steal campaign with religion which is at variance with politics. She said: “Each zone of the country has its peculiar problems. For me in this zone, girl-child trafficking should be considered one of our problems, though I know there is unemployment. Unemployment is the major factor that contributes to brain drain and also the girl-child trafficking. General Muhammadu Buhari is a leader who led Nigeria some decades ago and he is coming back now to sanitize the system. The insecurity in the country, the very poor healthcare system, lack of education and other basic necessities that people are lacking I believe Nigerians need somebody like Muhammadu Buhari now. "Any politician who talks to you about religion is a liar; he only wants to loot the treasury and the little resources you ought to enjoy. So say no to politics merging with religion to deceive the people."